The Lippincott farm was located off Route 70. The farmhouse was built in the early 1800's and remains today, located at Bradford Road and E. Burgess Road. A later addition to this house was seperated in 1906 and was rolled on logs down a meadow for a seperate residence, today the G Boys store. The driveway originally ran from Route 70 where Woodstream Shopping Center is today to the house. This farm contained 74 acres. The Vennel Farm, which consisted of 113 acres and was originally part of the Eves farm and later owned by John Lippincott, was located on the South side of Greentree Road. The farm was used by the British Army for an encampment in June 1778. The farmhouse is located on Hamilton Road at a point known as "Hamilton Hill". A cider mill was located along the creek. A small acreage was saved with the house, but this was sold in the mid 1990's and homes were built here, known as "Hillcrest Heights". 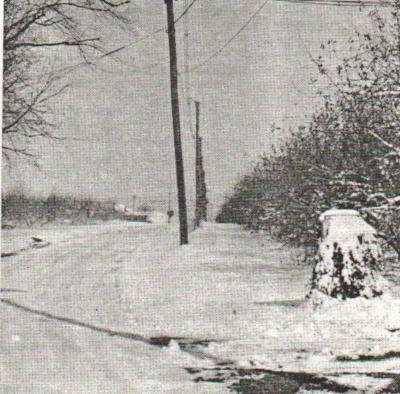 The drive ran between Cropwell Road, beginning where Revere Road is today, it ran past the house and ended at Greentree Road where Spinning Wheel Lane is today. The 117 acre Barton Farm was located on the North side of Greentree Road. The circa 1820 farmhouse was located on Greentree Road near Charter Oak Lane. After many years of vandalism and a fire, this house was razed in 1999. Some custom homes have been built on the grounds. Another Barton farm, owned by Joseph Barton, was located next to this farm across Pennsauken Creek in Cherry Hill. Fortunately the developers of Woodstream decided to allow the farmhouses from the farms they bought to remain as part of the development. This effort preserved some of the area's rural past. Located along the Northeast border of Woodstream was the Roberts Farm. At 300 acres this was one of Evesham's largest. The Roberts' main crop was fruit-apples and peaches. Horace Roberts bought several small farms in the early 1900's which his son Byron helped to maintain. Byron took control of the farm in the 1920's and operated it until his death in 1966. His son Malcom then became owner of the farm. The main farm house was located on the North side of Greentree Road where West Lincoln Drive is today. Another farmhouse, where Malcom lived, was located on Cropwell Road across from present Orchard Lane. There was a packing house and store where Greentree Shopping Center is today. The farm was sold in 1974 and was developed into Greentree Village, a planned unit development, from 1977-86. 1974 Evesham Township News article about the sale of Roberts Farm. The Holtz Farm was located on Cropwell Road near Rt. 70. Howard and Laura Holtz moved here in 1914 and purchased the farm from William Lippincott in 1928. The farm originally extended across Cropwell Road to Rt. 73, and across Rt.70 to Old Marlton Pike. Later, these parcels were sold and only the portion on the West side of Cropwell remained. In 1936 the farm became a dairy farm, cows could be seen grazing in a field along Route 70 until this frontage was sold in the early 1980's and the Pep Boys store was built. The farm remained active into the 1990's, operated by one of the Holtz children, by this time switching to soybeans and hay crops. As one of the of the last remaining farms in the area, the Holtz Farm was thought of as an island in a sea of development. However, this last holdout from the area's rural past has disappeared as the property was sold in 2000 to a developer for a luxury apartment complex, Brook View. Ground was broken in October, 2001 and both farmhouses were demolished late that month. The original portion of the main house was said to be built in the mid 1700's. 1979 article about Holtz Farm. The Charles A. Collins farm was located in Cherry Hill across the Pennsauken Creek from Woodstream. The farmhouse, demolished in the late 1960's, was located where the current Jaguar auto dealership on Rt. 70 now stands. The Collins' main crop was apples. Next to the Collins farm was a small lake, later known as "Quigley's Pond", a favorite hang out and ice skating place for Woodstream youngsters. The access road to Quigley's Pond was on Greentree Road, slightly West of the bridge. Photo from December, 1967 of Cropwell Road facing Route 73. Today Cropwell turns to the right at this point and connects to W. Lincoln Drive. The orchards of Roberts Farm line the road-apples on the right, peaches on the left. 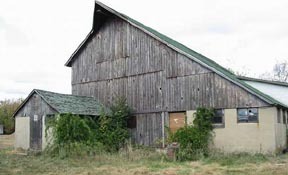 Barn at the Holtz Farm, Cropwell Road-demolished in November, 2001 to make room for the Brook View apartment complex. Herd of Ayrshire cows graze in the Holtz Farm pasture along Route 70 in this 1970 photo. This is currently the site of the Pep Boys store and Marlton Diner. 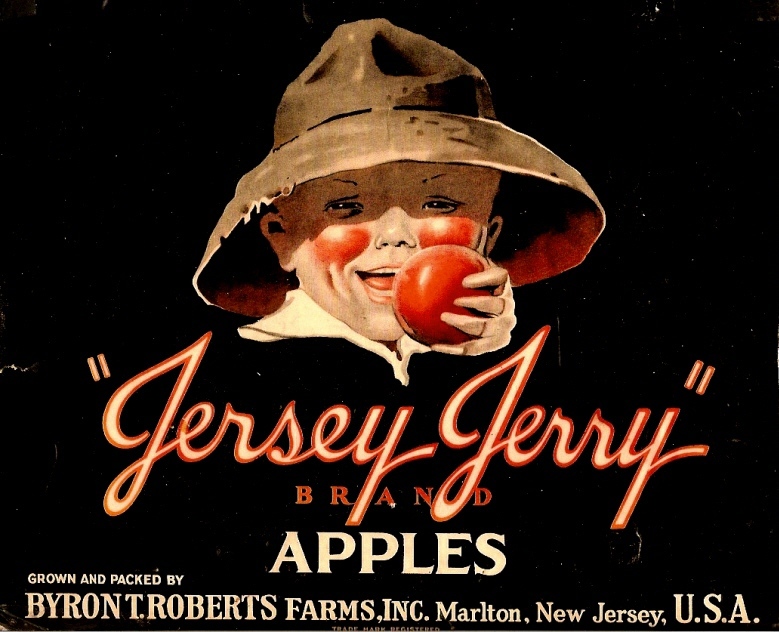 These labels were used on wooden apple crates from Robert's Farm. 1957 aerial photo showing farms that were in the Woodstream area.